You are here: Home / Uncategorized / Whilst I was away…. We went to Bear Lake for a while. Pre-emptive answer: No, it’s not particularly warm there this time of year. In fact, it snowed a little on Monday morning. We baked lots of round loafs of bread, this variety and Irish Soda Bread. We made 2 kinds of donuts. My boys got $4 haircuts. BC’s was $5. He’s a big spender. Keller learned how to tie his shoes. I daydreamed about buying this house. Too bad BC doesn’t have a job in Logan. We made a zipper pouch (similar to this) to hold Scrabble tiles. Seriously people, if you’re still turning them all upside down at the beginning of every game….STOP! Put them in a bag of some sort. Campbell split his face open 3 times. We ate dessert every night. We debated the difference between cherubs and cupids (the jury’s still out). We made wallets out of juice cartons. 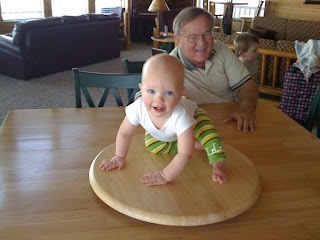 We put a baby on a Lazy Susan and spun him ’til his eyes went wacky. And now we’re home. We had a great week. Awesome week! Your juice carton wallet is gorgeous – what kind of juice comes in such a fruity looking carton?? Yeah, Keller is home! All I heard all week was when is Keller coming home? How come Keller isn’t home? 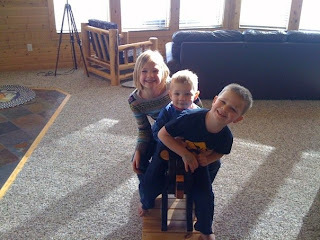 Why can’t we go to Bear Lake with Keller? I don’t think you can take Keller away ever, ever again. I will lose my mind if you do! Seriously, can I come next time? That looks really, really fun! Aww, fun! I miss Dan and Sooey. Thank you. I, too, am now dreaming about owning that house. Did you take the tour? I am glad you are back…though we didn’t get to talk much last night. I looked at THE house. Beautiful…I’d live there. That house is amazing – maybe Bryan won’t mind the commute too much…? Again, I’m amazed at the crafts… everyday can you just email me some daily inspiration? Looks like you guys had a great time and stayed really busy! It makes me want to go somewhere for a while. Glad you are back. That house is GORGEOUS! But seriously…Logan…that’s even colder than here! Just tell BC you are going to do a MAJOR remodel job on yours to get that porch! Sounds like a great week! I’ve got a lazy susan just like that (IKEA?) too bad I don’t have a baby small enough to fit on it. You are lucky you have somewhere to escape! i need to get away. is your mom busy next weekend?